Description: A twining perennial vine that can grow 15 to 20 feet. It has arrow shaped leaves and 1-2 inch funnel-shaped flowers that vary in color from white to pink. The flowers open in the morning and close in the evening. Habitat: Originally found in Eurasia. Bindweed is now found throughout the continental U.S. and Canada, as well as numerous other areas around the world. It is largely considered an invasive plant. 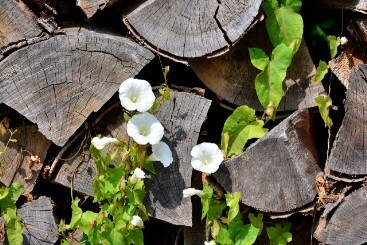 History & folklore: Bindweed came to North America in the 1730's. Known to many as morning glory, this invasive plant is actually very different from the ornamental morning glory species that we commonly plant in gardens. However, bindweed was originally sold as an ornamental plant and also as medicine. It is believed that it was also accidently spread through agricultural seed shipment. Most people consider this plant a weed, as it is extremely difficult to eradicate. The Greek physician Dioscorides is reported to have used this plant to stop internal bleeding and heal wounds. Medicinal uses: In western herbalism, bindweed is used as a laxative and a purgative. It has also been used topically to treat spider bites, and taken internally to slow menstruation and stimulate bile flow. In Ayurvedic medicine it is considered a brain tonic that will promote intellect and help with insomnia, confusion, epilepsy, psychoneurosis and neurological disorders. It is also used as a tranquilizer and blood purifier, for excess bleeding and venereal diseases. Magical/Energetic uses: The powerful energetic properties of this plant are useful in any ritual pertaining to binding, purging, and clearing negative influences. Carry an amulet with the dried flowers to counteract negativity directed towards you from others. When experiencing an intentional psychic attack, write the attackers name on a piece of paper and burn it along with a handful of dried bindweed. While the herb is burning, chant these words: "Your ill intent be bound to you. No harm to others can it do. Purge it now and set it right, send this darkness to the light."